After a lucrative television writing career comes to an abrupt end, ex–high school teacher Ray Mitchell returns to the New Jersey city of his birth—to rethink his life, reconnect with his teenage daughter and to spread the wealth on the housing project that reared him. He begins teaching again, embarks on an affair with a married woman from the old neighborhood and becomes a mentor to a former student recently released from jail. Then, disaster: he is found beaten nearly to death in his own apartment. He knows who did it, but he’s not talking, and he refuses to press charges. It is up to Detective Nerese Ammons—a childhood acquaintance from the projects—to get Ray to tell her what happened. the truth than of his potential murderer. 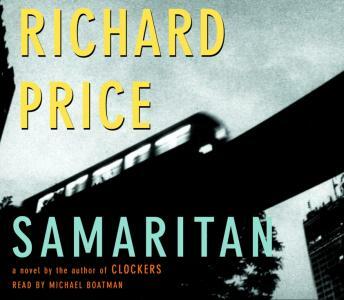 The Washington Post Book World has hailed Richard Price as having “the best equipment a novelist can have—that combination of muscularity, insight and compassion we might call heart.” Samaritan is an electrifying story of crime and punishment, of character and place, of children and their keepers—a novel of literary suspense that explores what happens when, caught up in the drama of one’s own generosity, too little is given, too little is understood and the results threaten to prove both tragic and deadly.